Historically, the water needs of fish and wildlife have been ignored in water allocation in Texas. Legally, surface water—the water flowing in our rivers and streams—is owned by the people of Texas, and in our name, the state grants perpetual permits to use this water to individuals, corporations, and cities. Texas, like most western states, operates primarily on the prior appropriation system in which the oldest water rights have the first claim on the available water. Before 1985, the state generally did not consider impacts on fish and wildlife when giving out permits. Unfortunately, over 90 percent of the water rights currently authorized were issued before 1985 and have no environmental conditions. Since 1985, the Texas Commission on Environmental Quality and its predecessor agencies have included some level of environmental flow protections on new water rights; however, the level of protection varies widely from permit to permit. These environmental conditions normally involve a restriction on when, or how much, water can be taken from a river or stream to ensure some water still flows downstream. In 2000, the San Marcos River Foundation (SMRF) made history by applying for a new water right permit for the sole purpose of keeping water flowing in the San Marcos River and into San Antonio Bay. Several other organizations soon joined SMRF and applied for environmental flow water rights in other regions of the state. These applications generated vocal opposition from water suppliers, and the TCEQ Commissioners dismissed the applications without a hearing. On the last day of the 2007 session of the Texas Legislature, a new Senate Bill 3 was adopted, establishing an environmental flows allocation process that has since been unfolding across Texas. This process will result in environmental flow standards that are intended to help ensure sufficient water flows in Texas rivers and into its bays by placing limits on new water rights permits. However, in a number of river basins, permits have been issued for all (and in some cases more than all) of the water that would be present in the stream during dry periods. If all water rights were fully used, those rivers and streams would go dry during a drought. 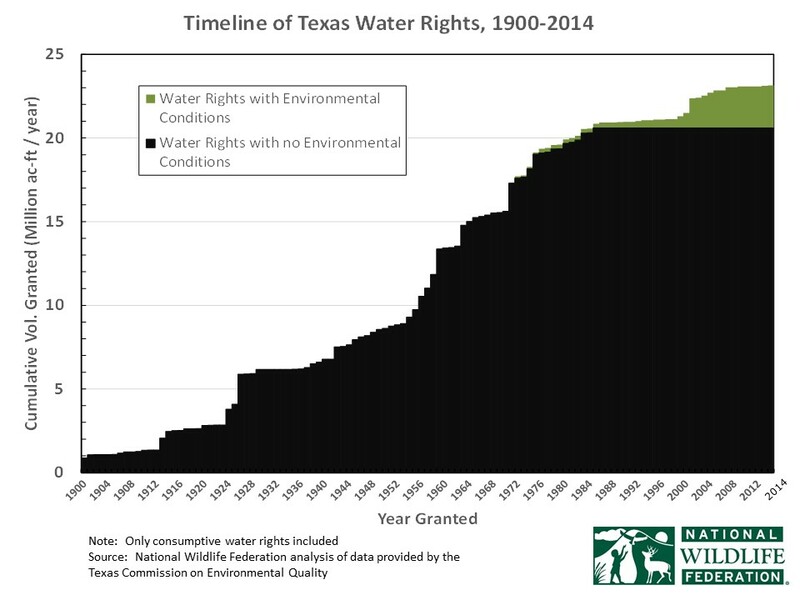 Many existing water rights are not currently being fully used, but that will likely change as Texas’ population grows. In addition, many streams and rivers are dependent on return flows of treated wastewater. Today many cities and industries are beginning to reuse wastewater instead of treating it and returning to the river or stream—a trend that could have negative impacts in certain places. The National Wildlife Federation 2004 study, Bays in Peril, found that five of the seven major bay systems in the state would face serious problems if existing water rights were fully used and wastewater reuse increased significantly. The report only looked at existing permits – it did not consider potential impacts from currently pending or future permit applications.